Since their inception in 1973, Laboratoires Prodene Klint, specialists in hygiene products, cosmetics, disinfection and remain faithful to the key words on which is based their success: quality, expertise and innovation. Subsidiary of EVA group Prodene Klint has retained its independence while becoming a major player in the hygiene market outside the home in France and cosmetics wipe. The skin hygiene and disinfection products designed, developed and manufactured by Laboratoires Prodene Klint are used in industrial, medical and food. With a production site near Annecy for cosmetics division and two production sites in the Paris region for skin disinfection and hygiene division, Laboratoires Prodene Klint are booming. They have an international presence: Germany, North America, North Africa via their subsidiaries, and the rest of the world via a network of preferred partners. Pharmacists and engineers Prodene Klint develop in our laboratories new formulations that meet the requirements of the market and anticipating your future needs. The Research and Development team of Prodene Klint is in constant search of innovative raw materials. They undergo a rigorous selection process before being used for the formulation of our products. The Prodene Klint laboratories are GMP (Good Manufacturing Practices). Hygiene products designed, developed and manufactured by Laboratoires Prodene Klint are used in industrial, medical and food. 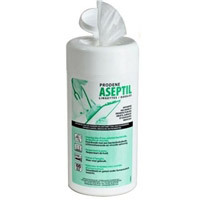 Products such as Prodene Klint ASEPTIL wipes, wipes AGROS SR or hydroalcoholic gels are today SEPTIGEL references in the field of hygiene.